Parenting is one of the most rewarding but challenging responsibilities we have. As parents, we sometimes struggle with the delicate balance of setting boundaries for our kids and letting them experience things they will inevitably encounter at some point during their lives. And drinking alcohol or the pressure to drink alcohol is certainly something your child may experience well before they reach the legal drinking age. The Centers for Disease Control and Prevention CDC reports that people aged 12 to 20 years drink 11% of all alcohol consumed in the United States. In addition to this, excessive drinking is responsible for more than 4,300 deaths among underage youth each year. And on average, underage drinkers consume more drinks per drinking occasion than adult drinkers. So with unsettling statistics such as these, many parents may think it is a good idea to let their children’s first drinking experience be with them. As a result, many parents will allow their kids to drink alcohol in a more controlled environment, as opposed to a party without adult supervision where there will likely be a lot of binge drinking. This way children will have the knowledge to drink wisely and will drink responsibly as they go through high school, college and young adult life. But according to recent research, letting your kids sip and taste alcohol may promote risky behavior! According to the report, about a third of all children will taste alcohol with their parent’s permission before the age of 12. Colder says this is not benign behavior and that his findings support other researchers who have also found evidence that sipping and tasting among children is not safe. He also says that alcohol use without parental permission usually happens around age 13 or 14. His study focused on children under the age of 13 (before they will likely encounter drinking alcohol without adult supervision). "These are not alcoholic families, but families that have more laissez-faire attitudes about underage drinking. The kids are also interacting with peers that have pro-drinking attitudes. We know that," Colder said. "When we statistically control for these contexts, this early sipping and tasting behavior is still predictive of these long-term outcomes." So it appears that when you let kids sip and taste alcohol, you may be sending them the wrong message. I think it is important to let them know that it is illegal and dangerous to drink alcohol before the legal drinking age. And alcohol can be dangerous even if you are of legal drinking age! In addition to discussing alcohol abuse with your children, talk to them about the toll excessive drinking can have on both their mental and physical health. For example, alcohol abuse can actually change your brain chemistry! “Our brains rely on a delicate balance of chemicals and processes. Alcohol is a depressant, which means it can disrupt that balance, affecting our thoughts, feelings and actions – and sometimes our long-term mental health,” according to one report. Alcohol is also linked to aggression which means you could become angry, aggressive, anxious or depressed. Abusing alcohol may also deplete essential nutrients from the body, like magnesium and iron. And you need to have adequate amounts of these nutrients in order to be your happiest and healthiest self. 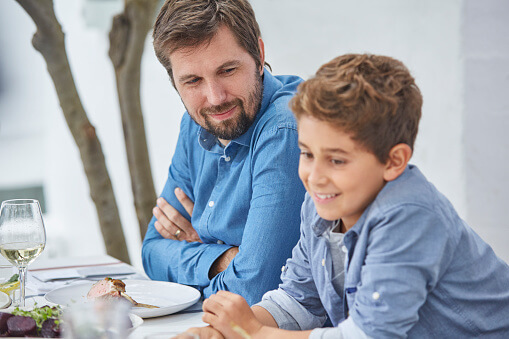 So talk to your kids about the importance of nutrition and how excessive alcohol consumption can essentially cancel out any good nutritional habits they may have. Read here to learn more about how you can protect your child from risky behaviors surrounding alcohol. Do not hesitate to speak with your children. You may find that your kids actually appreciate you speaking with them and that they will take your advice and guidance to heart.